The Scottish Fold cat had very endearing folded ears. There are different degrees of fold: single (also called loose fold), double or triple (the last being the most wanted for show cats). In the simple fold the ear folds in one places, and in triple fold it folds in three places making the ears bend totally flat against the head, giving the impression of a helmet almost. The triple fold ear is preferably small, and the fold very tight – the fold is right at the base of the ear, the smaller and tighter, the better. Bigger ears and looser fold cats are usually considered “pet quality” (the same adorable personality is still there, so this term does not mean the cat is in any way less lovable than the show cats). The ears are rounded at the tip. The ear flap hides the ear opening. The flap is stiff and cartilaginous. The founding cat of the breed, Susie, was a single fold; her ears bent forward from halfway up. The fold does not prevent the cat from moving its ears and so you can see it reacting to sounds, “pricking up” its ears and flatten the ears when defensive or angry. The fold may become less pronounced if the cat is upset or ill – also being in the heat may have a similar effect. Also the fold may become less pronounced if the cat has kittens. 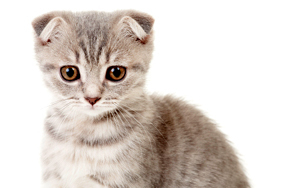 In US the Scottish Fold cat was crossed with American and British Shorthairs and the breed has developed a unique look of its own. It does resemble closely either one of the crossing breeds. Outcrosses to both breeds are still acceptable. The reason for the need of outcrosses is explained below. The Scottish Fold is a medium sized cat – as usual the males tend to be a bit larger than the females. The males weight about 9-13 pounds / 4-6 kg and the females 6-9 pounds / 2.7-4 kg. The body of a Scottish Fold cat is solid and compact (semi-cobby), and the contours are well rounded or padded, no matter from which angle you look at the cat. But even though the appearance is rounded, the bones are not heave – this cat has medium boning. The chest is broad, as is the body across the shoulders and rump. The tail tapers to a rounded tip and should not be short, kinked or stiff (why this is important is explained below). The legs are medium to short, in proportion to the body and muscular. The toes should not be splayed. The head of a Scottish Fold cat is rounded and domed at the top. The eyes, the second striking feature of this breed after the ears, are very large and broadly spaced – giving the cat the nickname owl-cat. The expression of the eyes is very sweet, innocent, slightly surprised, even sad. The eyes can be of all colors, but the most common is a golden coppery color. Whatever the eye color, it should correspond to the coat color. A Scottish Fold cat has well rounded whisker pads, and the whiskers often curve forward. The mouth curves around the pads and gives the cat a sweet smiling expression. The jaw is firm and well rounded and are the cheeks. The nose is gently curved in profile and is short and wide (because the eyes are so wide set). There is a slight stop between the nose and forehead. The muzzle is longer than that of a Persian cat. The Scottish Fold cat can be either short- or long-haired. 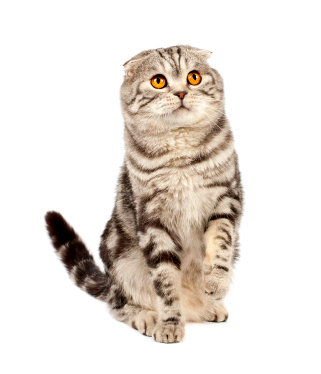 The short-haired Scottish Fold’s coat is dense and resilient, very soft and plush. The coat stands out from the body. The long-haired Scottish Fold is also called the Coupari, after the breed’s place of origin, the village of Coupar Angus. Already the original Scottish Fold in all probability had the long hair gene (as Susie was a barn cat and spontaneous long-haired Folds had appeared all along. Still, in the early years the breed was crossbred with many breeds, including the Persian in an effort to establish the long-hair gene. 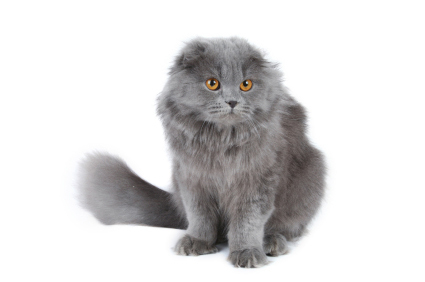 Also the British Shorthair, which is used in Scottish Fold’s breeding even today, has some Persian out crossing in the breed. So the long-hair gene has been there from the start. The long-haired Fold’s coat is actually semi-long, and quite full. Especially the males have a ruff, but both males and females have leg britches and huge, fluffy tails. Taking care of a Scottish Fold cat is quite easy. A weekly brushing is in order for the short haired Fold, but the longer coat requires a bit more care. The cat will love a daily brushing… (They probably run to you as soon as they hear or see you picking up the brush). Brushing prevents loose hair to be trapped in its thick coat – and also lessens the amount of cat hair on your furniture, so it benefits you too. The ears, because of their form, require attention. Wax easily builds up, so you need to clean the ears gently with a moist cotton swab at least every other week. Cats often don’t like it when you handle their ears, but despite this you must clean them. If you already know you would find the cleaning very uncomfortable (the cat may try to squirm its way out of the situation), then you could always get yourself a Scottish Straight kitten. Only 30-50% of the kittens in a litter have folded ears. 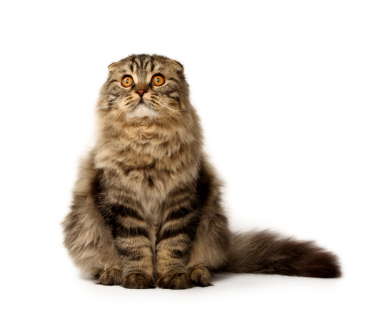 If you got yourself a Scottish Straight, your pet would have just the same sweet personality as the Scottish Fold – and you would need to clean the ears much less frequently. There are remedies, of course, should the ears get infected, but it is best keep your cat's ears clean in the first place to minimize infection risk. The Scottish Fold cat loves to be home at dinner time and has a tendency to obesity. So do not overfeed and play with your cat to keep it active and give it exercise. Your Fold loves to go out – but please use a leash instead of letting the cat go out on its own. There are many hazards out there – cars, foxes, people, dogs… Also, if your cat is not neutered / spayed, it may spread the fold gene uncontrollably and cause spontaneous fold to fold breeding in the area. This is not a good idea (read below). Usually this is a very healthy breed because of its farm-cat ancestry; life expectancy is between 12 and 18 years of age. However, the gene that causes the ears to fold, also affects the development of the spine. Because of this, if a fold-eared cat is bred to another fold-eared cat, a degenerative joint disease is possible. The condition is called congenital osteodystrophy. When bred fold to fold, the homozygous kittens is litters have a 25% chance of getting this condition (homozygous = the kittens have inherited the fold gene from both parents). This means at least one kitten in a fold-to-fold litter will have the disease. There will be deformities in spine, legs and tail; crippling distortion and enlargement of the bones. There is a slight chance of a fold to non-fold kitten having this same condition, but in that case the symptoms are less severe. The condition is not lethal and can be treated, but is painful for the cat. So do not breed fold to folds or get yourself a kitten from a fold-to-fold-litter. The first signs of the disease appear between four to six months of age. The joints of the tail, ankles and knees fuse and stiffen. A tell-tale sign of the disease is a very short thickened tail which lacks mobility. Also if the legs are lacking mobility also, you might suspect the disease. Scottish Straights are not known to have this ailment. At the early stages of the breeding many white cats were used. As the gene that gives the coat its white color is connected with deafness in all breeds of cats, some cats with hearing problems were born. At first it was thought it was because of the Fold gene, but this theory has later been proved to be wrong. A white Scottish Fold cat has just the same chance of being deaf as any other white cat. Because of congenital osteodystrophy Scottish Folds are not accepted for showing in most parts of Europe. But in USA great care has been taken in the breeding and if breeding fold to fold is strictly not done, then maybe in the future the skeletal problems will disappear. But until this has been proven to be so, it is not safe to breed fold to fold. And this is also a good reason not to let your unneutered/-spayed Folds roam outside freely. They might spread this painful disease. So always remember to check the kitten’s tail flexibility by gently arching the tail slightly upwards when you stroke it. Do the same to feet and legs, but always gently. There should be no thickness of stiffness nor splayed toes. All of these are symptoms of congenital osteodystrophy. Also watch the kitten move to see if there are any signs of stiffness. If you are interested in rading more about the different colors of the Scottish Fold, click here! You find a page for Scottish Fold Breeders here. And if you are interested in a rescued Scottish Fold, the page where Scottish Fold rescues can tell about themselves is here. Check if a shelter near you had written about themselves on this page.